A busy café, selling a variety of espresso-based beverages (espresso, latte, macchiato, etc.) 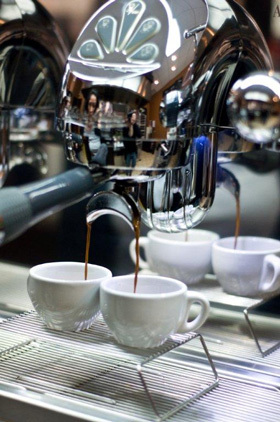 throughout the day, would require a larger-volume espresso machine than a small restaurant selling espresso or cappuccino along with regular or “drip” coffee at the end of a meal. 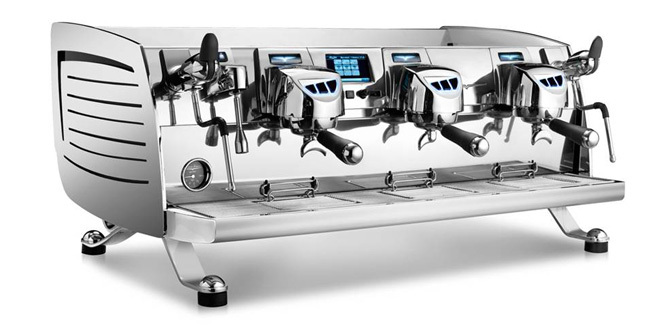 A2- or 3-group machinewould allow the café staff to prepare up to 6 espresso-based drinks simultaneously. Because of the high volume of business they do, Little Nicky’s Coffee (on Queen West in Toronto) and Fire Roasted Coffee’s two locations (on King Street in London, Ontario) all use the 3-group Nuova Simonelli Aurelia T3 machines to manage the hundreds of espresso drinks they sell daily. A restaurant serving only after-dinner espresso or cappuccino can use a more basic setup than a busy urban café with a large menu, larger drink sizes and high customer turnover. And if the café decides to serve “Americano” instead of regular coffee, the espresso machine is the source for all coffee drinks unless they install a hot water tower. 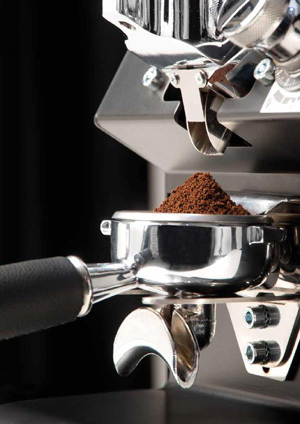 An espresso grinder is also required, and there are different types from traditional doser grinder models to doserless and low RPM versions. 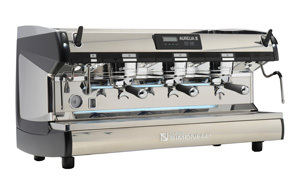 Also, a small secondary grinder like the Nuova Simonelli MCI or the Grinta may be required for decaf espresso drinks, and for cafés like Café Domestique (in Dundas Ontario) who offer a selection of different espressos (such as a traditional espresso blend along with a single-origin bean). 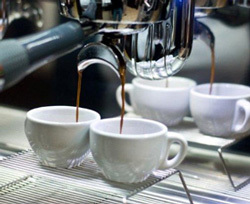 A café in Little Italy (or other ethnic areas where espresso is preferred over regular coffee) needs to produce a large quantity throughout the day with even higher demand during peak periods. The same is true for establishments in busy urban centers or with a large take-out business. 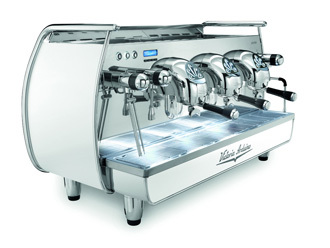 If only occasional or limited demand is expected, you might start with a smaller machine such as a one-group or the compact Elektra Sixties 2-group (with single steam arm or steam wand)and upsize later if demand increases (reputable companies will allow you to trade-up for a higher-volume machine). In their first location, Jimmy’s Coffee (on Portland Street in Toronto’s King West) started with a Nuova Simonelli Aurelia 2-group but upgraded to a 3-group after only about 6 months due to their huge success. If the drinks will not be made by a dedicated “Barista”, you might consider a “Super-Automatic” machine, which can be easily operated by anyone (e.g. 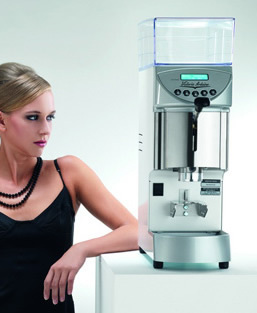 a waiter or casual user), though the quality and visual appearance of the drinks may be greatly diminished if the machine is not commercial-grade. 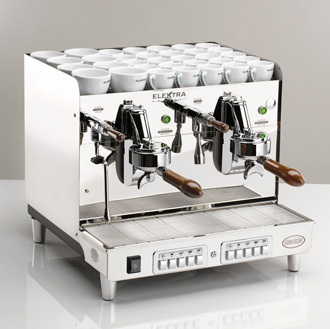 If only occasional or limited demand is expected, you might start with a smaller machine such as a one-group or the compact Elektra Sixties 2-group (with single steam arm or steam wand) and upsize later if demand increases (reputable companies will allow you to trade-up for a higher-volume machine). 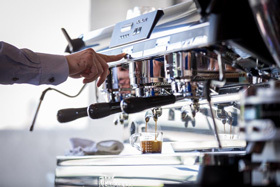 In their first location, Jimmy’s Coffee (on Portland Street in Toronto’s King West) started with a Nuova Simonelli Aurelia 2-group but upgraded to a 3-group after only about 6 months due to their huge success. 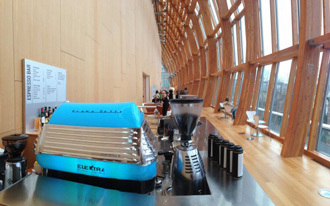 The Art Gallery of Ontario (AGO) chose a gorgeous traditional Elektra Blue Barlume for their café, but selected the FRANKE Evolution 2-step in their other three foodservice establishments. This was so their large number of servers (with varying barista skills) can each quickly produce consistently high quality lattes and cappuccinos, as well as hot espresso topped with the all-important “crema”. 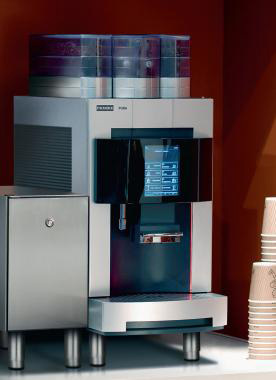 Will the machine be a highly visible focal point of your establishment? Or hidden away in a kitchen or service area? If aesthetics as well as performance are key issues then brands such as Victoria Arduino or Elektra – featuring shining chrome or copper & brass exteriors, backlighting and various designer looks – could be the machine that sets your establishment apart. 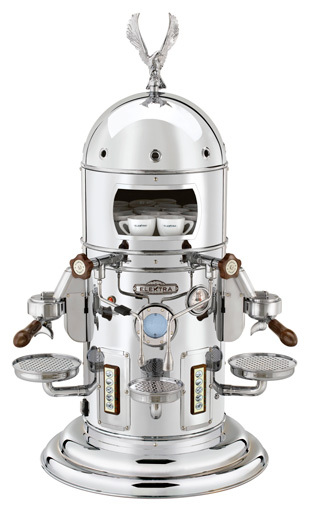 Many businesses have chosen the Elektra Sixties espresso machine, because it is a compact machine offering great performance at a very competitive price-point, with the added benefit of being able to match any décor, with its stunning metal body composed of highly-polished stainless steel. Diana Olsen, owner of Balzac’s Coffee Roastery, found the turn-of-the-century styled Elektra “Belle Époque” perfectly complemented her Parisian-style café in Toronto’s historic Distillery district. The owners of The Sovereign Espresso Bar found the vintage look of the Mosaic Green Elektra Classic Barlume was the perfect match for their eclectic neighbourhood café on Davenport Road in Toronto’s west end. 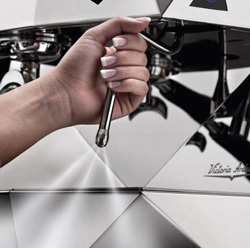 – part of machine where espresso is brewed or extracted from the coffee grounds; each group can produce one or two espresso shots at a time as per Barista’s needs. 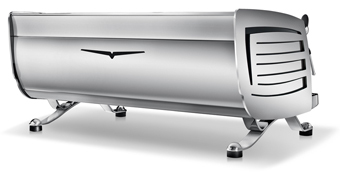 – the removable “holder” where coffee grounds are pressed or “tamped” into the steel “filter” insert; a single filter holds 6-9 grams and the portafilter has one spout, while the double holds twice the coffee grounds and splits the espresso to pour into 2 cups (NB: larger drinks require a double espresso shot to maintain the correct strength and flavour). 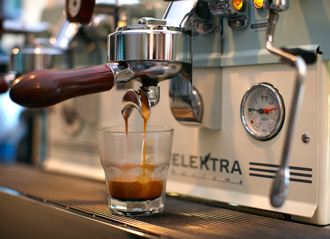 – a shot of espresso in a standard-sized cup filled to the brim with hot water. 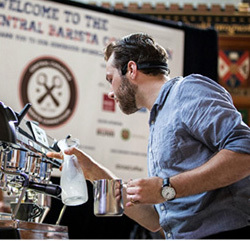 – traditionally have a compartment on the front to manually dispense a pre-measured dose of coffee grounds into your portafilter (pull the lever once for a single espresso and twice for a double), but most new grinders are “doserless” and digitally programmed to grind the exact amount every time directly into the portafilter; and a “low RPM” version grinds faster with less friction to burn the coffee oils. – extends from front of machine allowing steam (produced in boiler) to be used to heat milk (or hot chocolate, cider, etc); the valve that releases the steam is opened by a lever or a screw-type knob; all espresso machines have one or two steam wands (based on anticipated need) usually one on each side, though the Elektra Kappa and Aletta place them side-by-side to duplicate a “production-line”; some models offer a “cool-touch” wand to protect the Barista. 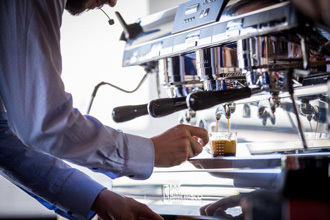 – a coffee-bar-tender specifically trained to make espresso-based drinks; although in North America the Barista is often a lower-paid job performed by students in some countries it can be a respected career. 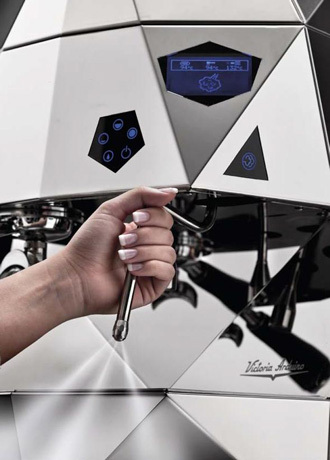 – an espresso machine that will grind, tamp and pour espresso shots to a pre-programmed amount at the push of a single button; some types will also automatically steam and dispense the hot milk into the cup, or have a steam wand that “foams” the milk to a pre-programmed temperature; they also have automated cleaning cycles. 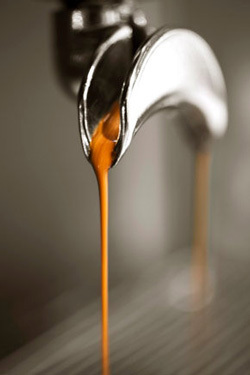 – the thick, medium-brown top layer of “cream”, indicating proper extraction of an espresso shot. The oils and CO2 (present in all roasted coffee) are emulsified under heat and pressure.